Dubai leading Hypermarket & supermarket Group- Al Maya Group hiring staff for various positions. Benefits include Free visa, accommodation, medical insurance and air tickets. About Al Maya Group and careers: Al Maya Group, headquartered in Dubai, UAE, is a diversified company established in 1982 by Founder and Chairman Mr. L.K.Pagarani. The Group's core business' consist of Distribution of Food and Non-Food products, Supermarkets and Lifestyle Retail (Borders & Paper chase). Benefits : Free Visa, Accommodation, Medical Insurance and Air Tickets. 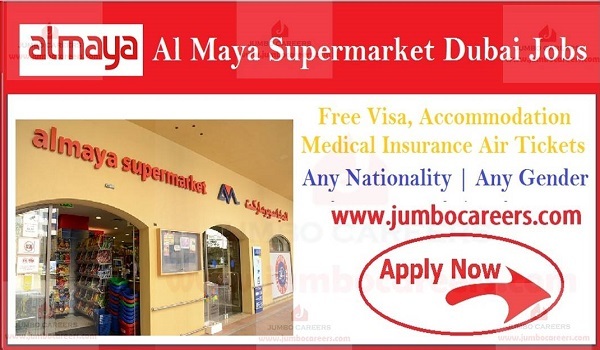 Interested candidates for latest supermarket jobs in Dubai and Al maya Hypermarket jobs in Dubai may apply directly.